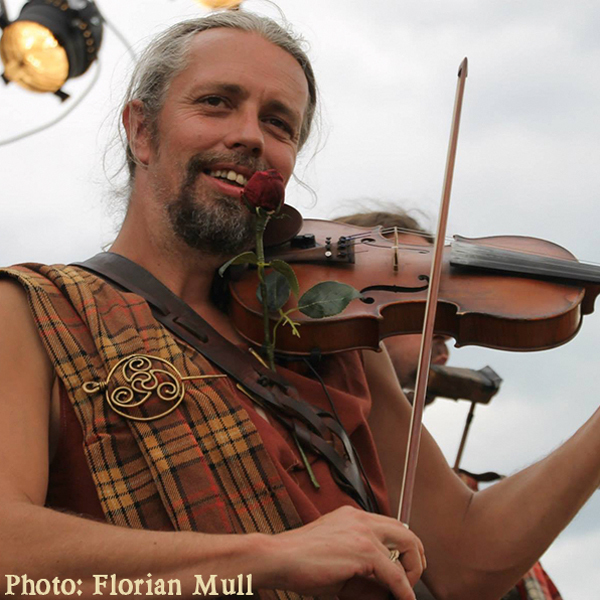 The musicians of Rapalje with their wild hair and medieval kilts create a flaming energy with their enthusiasm and motivation. 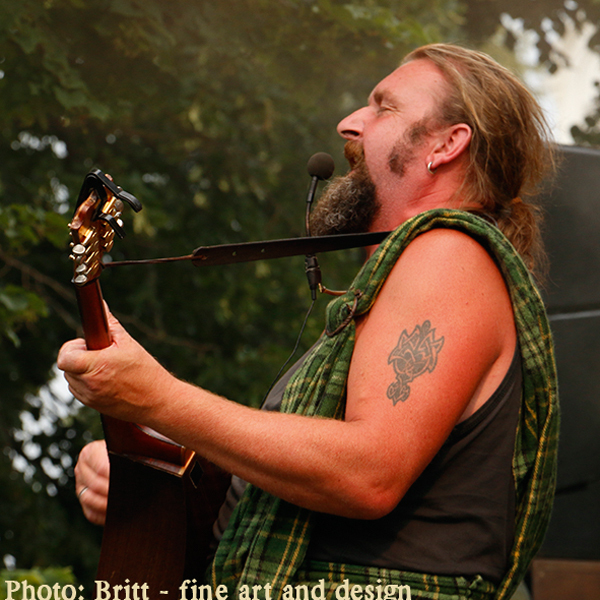 With sensitive ballads, fiery songs and vivacious Celtic melodies Rapalje electrifies their audience. A concert of Rapalje is like a journey through time with recognizable licentiousness and a rough way of life. Dieb started his career, when he met Maceál in his local pub ’1672’. They formed a band with some other musicians and played symphonic rock music. This music was soon changed into folkrock. After hearing celtic folk music, the rock part was kicked out of the band and Dieb and Maceál started a duo called ‘Ruk en Pluk’. Dieb tried to play the accordion and Maceál the guitar. Every time Dieb had a new instrument it had to be tested on an audience immediately. …that in addition to the important musical contribution Dieb provides for the band, he is also responsible for the graphic artwork of Rapalje. For example: he created the logos of Rapalje and the Rapalje Zomerfolk Festival. This half-Scottish enthusiast started playing the Scottish bagpipes in 1992 with the ‘Clan MacBeth Pipe Band’ from the city of Groningen. Nowadays, he is an instructor with this band as well as with ‘The Islanders’. 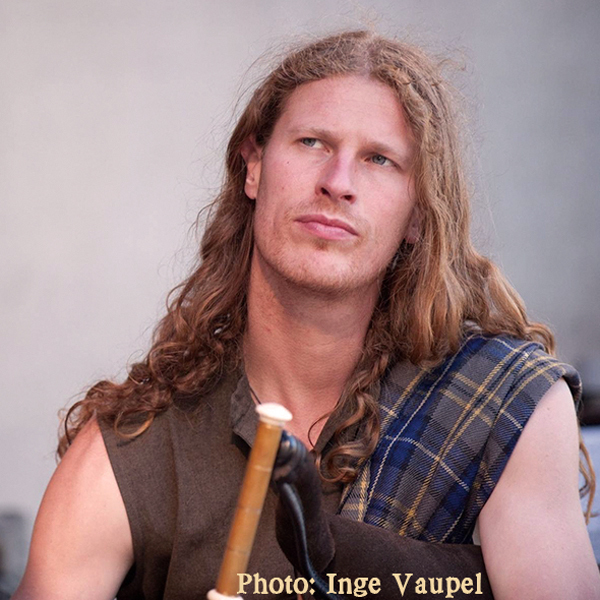 David was ‘discovered’ by Rapalje during a Scottish festival, where he stood out amongst others because of his obvious talent and melodic way of playing. Playing Scottish bagpipes, tin whistle and low whistle this youngest asset to the band blows a fresh breeze through Rapalje. 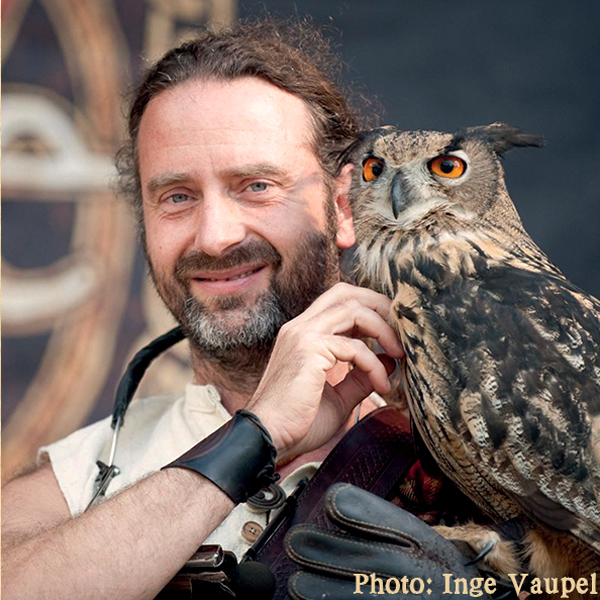 …that, in addition to his activities for Rapalje, David is also the initiator of the Rapalje Zomerfolk Festival? Zomerfolk is the annual music festival the band organizes in Groningen. Well known as a street performer in Groningen and Oldenburg because of his voice, music and charmes. Maceál playing on one side of the street and William on the other, playing the same instruments, didn’t work out. When Maceál learned to play the squeeze box and the tea-chest-bass they tried to play someting together. Maceál already had a duo with Dieb and introduced William to the band. His first introduction was on the CD ‘Celts in Kilts’. He sang the song ‘Jock Stuart’ and played gitouki on ‘The Drunken Sailor’ and ‘William’s Favourite’. …that William, besides being a valued member of the band, is also known as the cook of Rapalje? He takes care of almost all meals during their tour, so everyone eats not only healthy but above all very tasty! This multi-instrumentalist was at first a one-man-band playing eleven instruments at the same time. Nowadays he playes three instruments simultaneously and thus, adds two imaginary bandmembers to Rapalje. After ‘Ruk en Pluk’ a group was formed with the name ‘De Eikeltjes aldus Ronald’. The first attempt to have a decent name was with ‘Klootjesfolk’. He invented a new instrument, the gitouki and complete new tunings for the mouth-organ and the squeezebox. …that Maceál is so much more than just a musician in the band? He builds all of the sound systems for Rapalje and rents out other self-built sound systems to other bands and events, through his own company.